As with all highly competitive endeavors, whether they be sports, academics, or cooking, top contenders get where they are a the top of the list through indefatigable application of physical and/or mental aptitude. 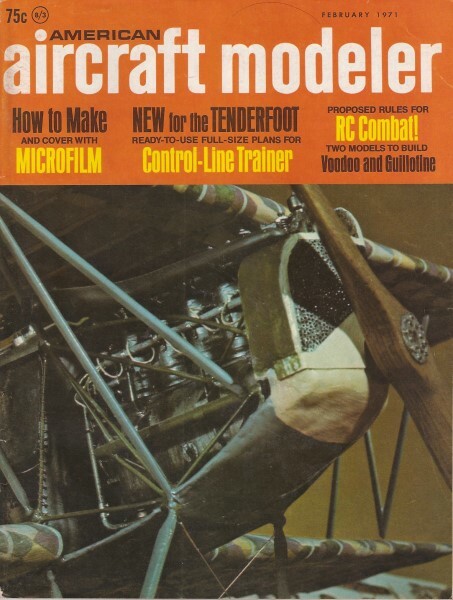 In events such as model aircraft building and flying, simply following the lead of others is usually not enough to attain the ultimate goal of being a world class celebrity. Such is the case of Steve Wooley and his Cobra control line stunt model. At this point in the evolution of C/L aerobatics, improvements in airframes and engines are subtle, so pilot skill becomes more and more important to be that winning combination. Luck (or bad luck) still plays a role, however, in any outdoor competition whose vehicles are prone to even small perturbances of the air. That, and relying on both the objective and subjective skills of human judges makes this type of competition grueling. Steve Wooley, a multi-discipline competitor, died in an auto racing accident at the young age of 32. Website visitor Bruce J. wrote asking that this article and plans be posted. Fortunately for the Stunt event, there are several successful philosophies of design. Some argue for realism, scale, and large size. Others go for low front area, big elevators, 35 engines, and classical lines. This old classic precision aerobatic control liner is still winning. It is based on National and International successes by the author. 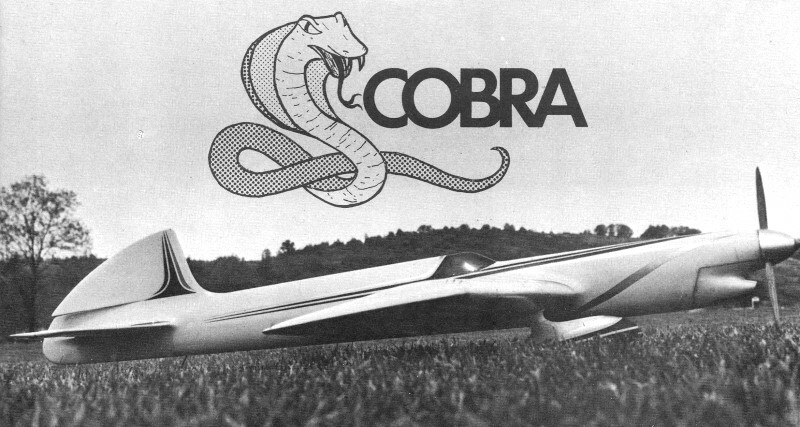 Cobra is my approach to precision aerobatics with a control line model. It is not a stunter - the twin-boom, tri-motored, jet-styled models of the past several years are. 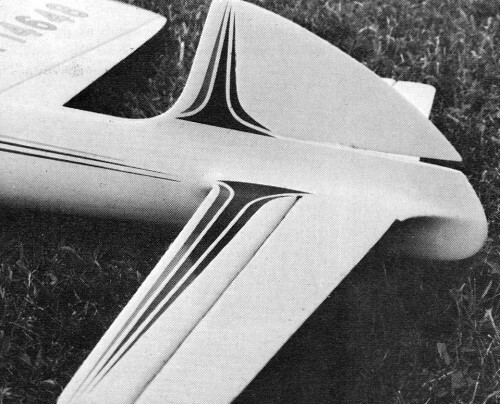 It is significant that, while the 1968 FAI Control Line Team selection events were crowded with jet-styled models, it was the conventional aircraft that finally placed one, two, three, four. 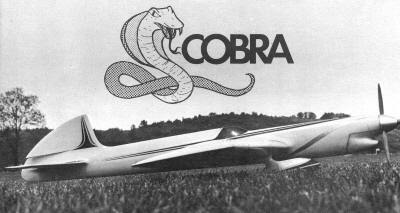 Cobra was in this group and carried the U.S. colors to Helsinki, Finland, where it finished fourth in the 1968 World Control Line Championships. 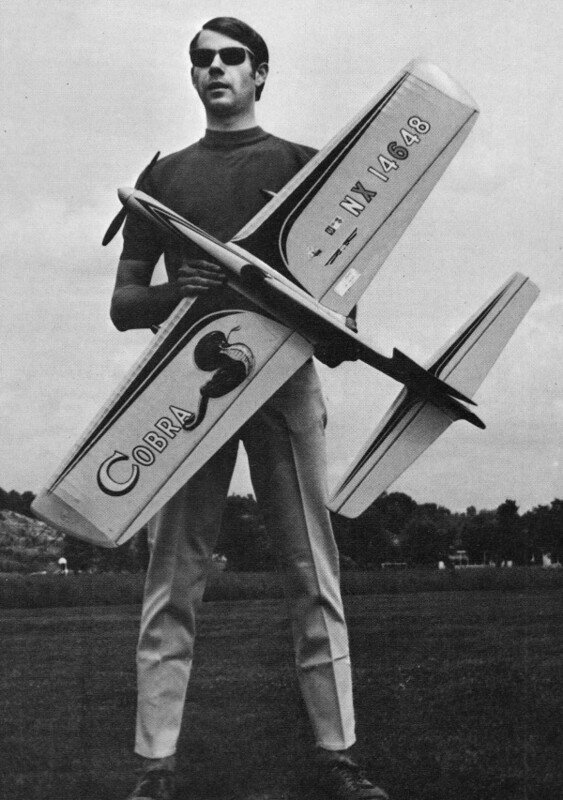 Not without a pedigree, Cobra is derived from the successful Argus, which I flew to berths on U.S. Control Line Teams twice and which helped bring the title of World Precision Aerobatic Champions to the U.S. teams both times. Built in 1959 and first flown in 1960, Argus is still capable of performing contest caliber maneuvers and has never been altered in any way since its construction. 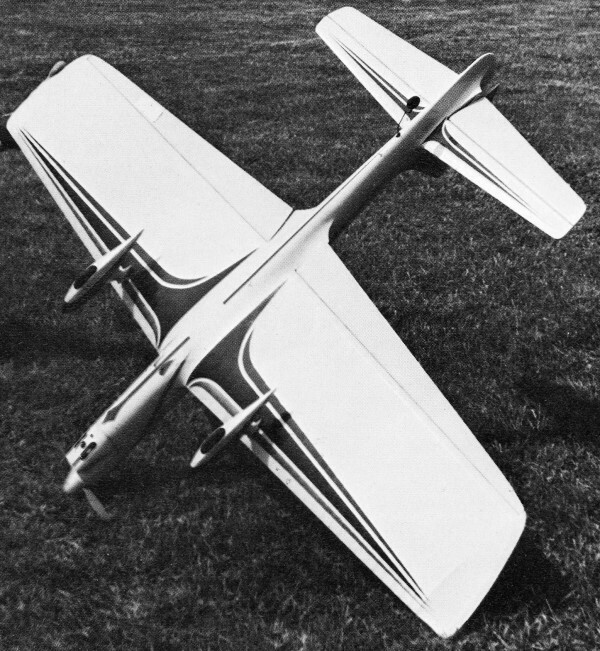 But it is a small aircraft and has shortcomings. Large flaps that provide a slow, smooth turn for the original FAI pattern (no squares) require much effort in AMA contests. 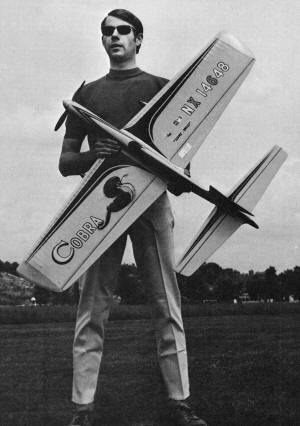 Steve Wooley with his Cobra. The article goes into more of what it takes to win than just the airplane. Steve believes in "impression" points - says "Be professional about it." A first-flick start helps the score too, so model is always inverted to start. This allows an unhurried flight. Model is not placed on ground until pilot signals for launch. Attractive undersides are of value in aerobatics because the bottom is in view almost as often as top side. The aircraft and its flight must impress the judge every moment. The plane's graceful curves are enhanced by the generous fillets, which also increase strength. Use soft balsa or leather. 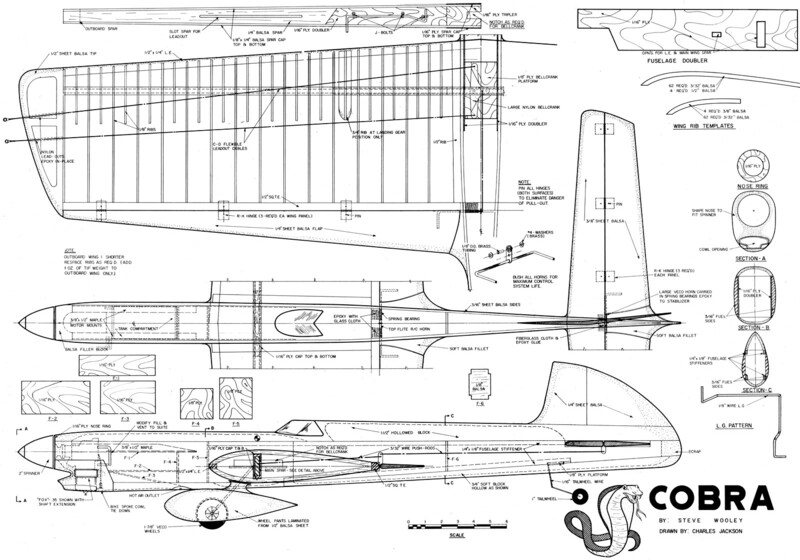 Therefore, Cobra is larger by 80 square inches, has smaller flaps, and a very large horizontal stab and elevator. This ship will turn with anything flying but, since I feel a rather harsh overall pattern appearance is produced by the T-Bird or Shark type of turn, nose weight was increased until the desired kind of turn was achieved. Weight was added by machining a brass crankcase cover for the engine and trimming it until the proper ballast was reached. I am not a scientific builder. My models could be compared with a bumble bee; perhaps they shouldn't fly, but they certainly do. 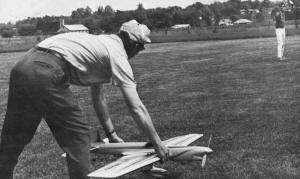 I use no dihedral or anhedral in the wing or stab, no differential flap control, no three-bladed props, tricycle gear, or twin engines. I prefer the classic approach to precision aerobatics. Gimmick models may enjoy some limited success, but in the long run the classic ship will far outdistance them. Cobra is a second generation Detroiter-type design of the Argus, Ares, Atom class and, along with Billy Werwages' Ares, seems to be the only model of this lineage enjoying success in recent seasons. However, the present larger Ares of 700 square inches was originally flown with a K&B 45, so Cobra is somewhat unique. It is interesting to note that Werwage has never enjoyed the success with his Super Ares that he had with the normal-size airplane. Construction is quite simple. 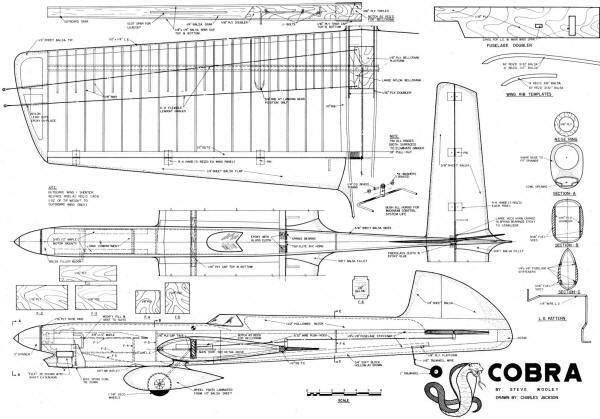 It is assumed that those interested in building the Cobra are competent modelers, so detailed instructions are not needed. Begin by constructing the main spar or I beam. Install the control system and slip on the assembled fuselage sides. Glue the front formers in place and then glue the spar-fuselage assembly together. Invert on a flat surface and slip the leading and trailing edges into position. Jig up to the proper height and secure. Now begin gluing the ribs in place, always trimming from the trailing edge of the rib, never the leading edge. When dry, remove from the jigging and glue the top ribs in place. Install the flaps and tips. Cement the rear fuselage former in place and tack glue on the fuselage blocks. Carve to shape; then remove and hollow to a 1/8-in. wall thickness, taking care to keep the rear fuselage sections as light as possible. The stab-elevator assembly is installed next. Solder in the pushrods. The tail-wheel fixture is added, and the shaped fuselage blocks permanently glued in place. Use epoxy to attach the plywood nose ring. The engine is installed next. Assemble the cowling and carve to shape. 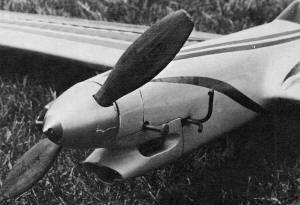 Bolt the landing gear, with wheel pants already attached, to the main spar as shown. Add cockpit detail as desired. Glue the canopy in place and begin to build up the wing and stab fillets of plastic balsa (or leather, if preferred). The aircraft is now complete except for finish. Cover the fuselage and sheet balsa areas with lightweight Silkspan. Then lightly sand with 320 wet-or-dry (it cuts the rough edges right now - courtesy of Art Adamisin) , Two coats of clear dope should seal nicely. G. M. Silkspan is used wet to cover the wing, followed by four or five coats of clear dope. Apply base color as desired, two coats will be satisfactory if sprayed. Trim lines should be masked when the base is thoroughly dry and can be brushed on. Two coats are enough. Use a spray outfit to give the model two to three coats of clear, and then put the ship away for two or three weeks. By then, all the trapped thinner should have evaporated, leaving a nice hard finish for wet sanding and rubbing out. The Cobra is an extremely capable model. Treated with care, it will provide many years of competitive performance, barring pilot error. The following observations, made during several years of intensive contest flying, should be of value in making you and your Cobra a successful combination. Leading competitors have been discussing something called impression points. Let's face it, they are real and, more accurately, should be called pilot appearance points. A competitor's manner, dress, and conversation all make an impression on the judges, which is frequently reflected in the scoring. Therefore, be as neat as possible, and dress to be noticed favorably. Above all, be professional. By handling yourself and your model with confidence and competence, the battle is half won. Avoid dramatics during maneuvers. Body English won't help and it tends to distract judges' attention from the aircraft. Cobra is always inverted for starting, to insure first flippers and gain those valuable points. The wheels never touch the ground until the instant of launch, eliminating the possibility of a chipped prop. Educate your helper on this point. Know your engine and treat it with respect. I have used a Fox 35 with one additional head gasket and an O&S needle valve assembly for several years. I also use a 25% nitro fuel (after many years of un-nitrated fuel) and a 10-5 prop. This combination produces an rpm range in which the engine can develop its maximum power. Use light machine oil in the motor between contests. A Fireball long-reach, cold heat range plug lights the fire and keeps it lit. If using the O&S spray bar, don't reduce its diameter. It does restrict the venturi more than the standard Fox bar, but it also increases fuel draw. the extra power available in the nitrated fuel more than offsets the potential power loss. Practice with the Cobra until a satisfactory pattern is achieved, then hang it up. I'm firmly convinced that most of today's fliers are over-practiced. Instead, make two or three flights the evening before the contest to insure that all systems are go. Then, one additional flight the morning of the contest, preferably at the contest site, should be sufficient. Clean and wax the model so it is in top shape for appearance judging. From then on, it's all up to you and Cobra. Tank filler and vent are faced forward with long brass tubes. Both engine and tank are removable. Nicely carved cowl.